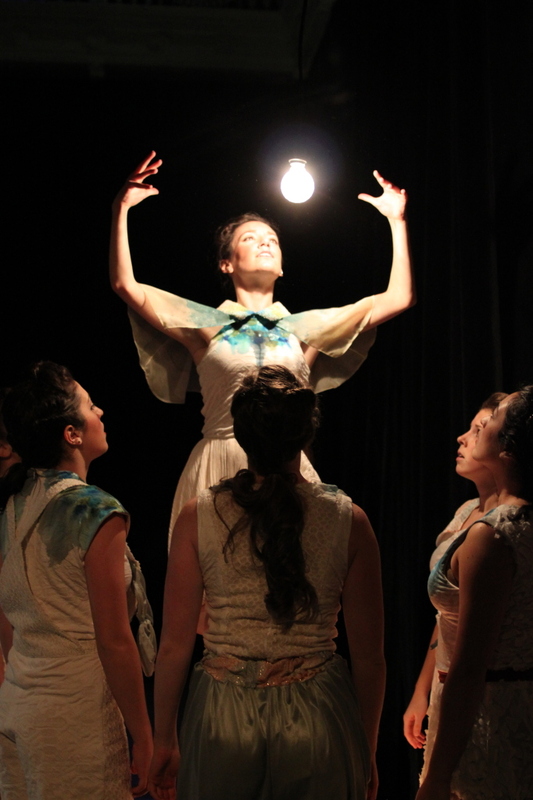 (Cambridge, MA) In the director’s note, Merli V. Guerra and Kimberleigh A. Holman describe the most relatable elements of the Sleeprunner as “sleep, dreams, and the surreal.” The production incorporates the human need for sleep, modern dance, and tech design to create a tangible metaphor for a universal experience. At times grotesque but always beautiful, this production explores through motion what it is to experience a deep, meaningful rest. Sleeprunner relies heavily on the abstract movement concepts of modern/contemporary dance to bring to life highly esoteric condition of dreaming. The choreography from their other productions integrates more from the classical styles and is therefore more familiar to the uneducated viewer. Audience members should prepare themselves for a nontraditional dance theatre experience. We are eased into this abstraction by the first piece of the evening, “To Sleep!”. It is quiet and a bit elusive, like the subject at hand, but settles over the audience gradually. This is to say, we are treated to fairy tale-like prologue within the first piece. There are even crickets to lull us. From there, the performance edges into unfamiliar territory. The subsequential pieces dive directly into modern dance with static movements, athletic lifts and imaginative use of props. In “An Obscure Journey” dancers are blindfolded and lead across the stage by a partner. The audience is perched on the edge of their chairs as we watch the company make their way across the floor. Their trust in each other is profound. They are almost as vulnerable as anyone is once asleep and unaware of the world. It reminds one of the risks taken when dreaming. Most of the pieces are serious but two in particular “Idle Reverie” and “Highest Moon” celebrate humour. “Idle Reverie” pits Tyler Catanella and Guerra in a duet. They dance to a spoken word recording by two unnamed actors navigating a late night platonic tryst. Catanella move well together. Both encourage the audience to laugh as the converse through movement that reflects and seems to lead the conversation. “Highest Moon” is set to a manipulated version of the Ella Fitzgerald classic, “How High the Moon.” At times, the music is warped, set at a reduced playing speed to induce hullicatory effects in the choreography (not the audience). The company is creates dreamscape of motion that is lyric and confusing. There were some frustrating moments in the Sleeprunner. It is obvious that what we are seeing is Art but it is difficult to suss out what exactly is going on in each piece or if the pieces are part of a longer narrative that spans the show. To fan the fire, the show is energetic but barely scratches the surface of the abilities of the dancers. We don’t see the technical range exhibited in Luminarium’s Secrets in Motion or Mythos:Pathos. Regardless of what we don’t see, what we do see is beautiful. Luminarium’s dancers are excellent. Across the hall from the performance is a small gallery featuring paintings from local artists. Should you get to the Multicultural Arts center early, the gallery is a worthwhile to spend a few minutes before being seated. Currently showing is “The Subject of Women” by Cynthia Brody. The exhibition runs through February 6, 2015. This entry was posted in Dance Theater and tagged 2014, ballet, Cambridge, Christopher Nolan, Christos Zevos, contemporary dance, Cynthia Brody, December, exhibit, Inception, Kimberleigh A. Holman, Kitty Drexel, Luminarium Dance Company, MA, Merli V. Guerra, modern dance, Multicultural Arts Center, The Sleeprunner by Kitty Drexel. Bookmark the permalink.